International reggae artiste, Orville “Shaggy” Burrell has gone ‘green’ in the interest of raising awareness on climate change and encouraging a more secure climate future. Shaggy and sidekick Rayvon on stage in Copenhagen. He announced his move with his performance at the ‘Seal the Deal: Dance for Climate Change’ concert held in Copenhagen , Denmark on December 7 to raise public awareness about how a changing climate could devastate people’s lives and livelihoods. So, interspersed within a scintillating performance of about seven of his most popular hits, Shaggy and sidekick Rayvon encouraged the thousands in the Parken football stadium to go green and embrace a more environmentally friendly lifestyle. “Remember we are doing this in the name of the environment – always remember to go green,” he said as he closed a show that featured 12 other mostly European acts. His message on stage seems backed by a strong personal view on climate change. “To be honest with you, we can’t afford to sit down and ignore this climate situation. Look at all these hurricanes that we are having in the Caribbean . If you really think about it, all of this is because of climate change,” he said in a back stage interview. “If you take a look at Haiti , it is a classic example of [how humans impact the environment]. As soon as a little rain falls, it’s chaos… There is mudslides and buildings falling on top of each other and there is no infrastructure and people suffering [in part because there are few trees],” he added. It is against this background and his philanthropic beliefs, he said, that he had opted to be a part of the awareness-building concert in Copenhagen during a particularly busy touring schedule as well while preparing for his own benefit concert for children in Jamaica early in December. 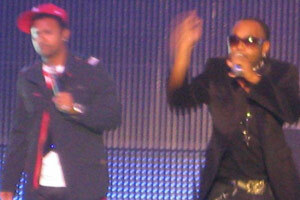 Artistes like himself could draw attention to social issues based on the popularity of their music, said Shaggy. “It is easy to do a song about it (climate change); it is not something I would rule out,” he said, adding that artistes were a powerful influence. “This is a little bit of entertainment. If you get big artistes on stage then you get big media and big media carry big coverage and big coverage can get the word spread for this particular cause,” he said. “A performance at the end of the day is just going to be a performance for entertainment. It is the mileage that you get out of it as far as the media and the awareness, that is why we are here,” Shaggy added. But beyond “public speak”, the artiste is making adjustments in his own lifestyle that signals a true commitment to the climate cause. “I am a recycle man within myself [and] I am going solar at my home to cut down on the light,” said the man who in recent times has developed a reputation as a philanthropist. He added that he was also looking at a hybrid vehicle, but joked that they were not particularly attractive. “Mi think dem need fi start to mek the little hybrid car little bit more cooler because some of them too ugly. Mi a one cool boy weh like inna one nice car weh look cool. Mi nuh like dem baby mother, soccer mom looking thing deh,” he said. Still, he said he is looking into the Escalade and considers the move worthwhile. “We need to be educated a lot more about how we can integrate the stuff into our lives more. When it becomes second nature then it becomes easier,” Shaggy said. Excellent move Shaggy!! Nuff respect!! Merry Christmas and a Happy New Year to Abeng and its staff. Nuff respect!! Thanks Esteban and all the best to you and our other dedicated readers. This is the end of our second year of Abeng News and we hope you will grow with and help us grow.